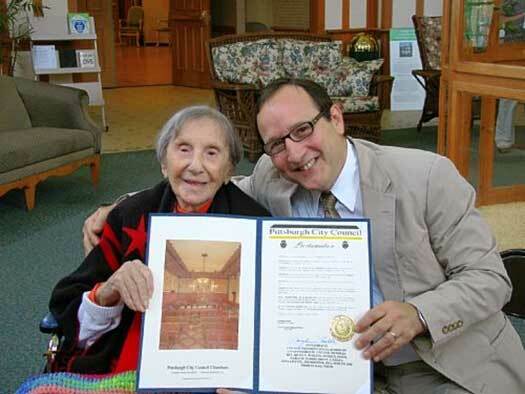 Mrs. Evelyn Kozak, at her 110th birthday, was declared by Pittsburgh City Council President Doug Shields the oldest Pittsburger. Mrs. Evelyn Kozak, the 7th oldest person in the world, passed away yesterday, Gimmel Tammuz, at the age of 114. She as a young woman received a blessing from the Previous Rebbe for long life. Her father, Isaac Jacobson was close with the Rebbe and brought his critically ill daughter to him for a brocha, with which she merited Arichus Yomim. Mrs. Chava Rivka Kozak, her Jewish name, spent years breaking records — she was the seventh oldest person in the world, the oldest Jew, and one of only six Americans left who were born in the 19th century. Mrs. Kozak recalled with perfect clarity where she was when hearing about the sinking of the Titanic in 1912, and she had a photograph of her father with President William Howard Taft at the opening of the first Hebrew Orphan Asylum. But to her family, Mrs. Kozak was a loving grandmother, solicitous over their well being and an ever-giving woman of fortitude. Mrs. Kozak attributed the brachah for her extreme longevity to a variety of factors. She told a janitor at a nursing home that it was since she had “a good conscience.” Other times she would say that it was because she liked to help people and that she never harmed anyone. She told some people that she lived so long since she believed in being straight and truthful. She told a secular historian that the reason was that she walked five miles a day and kept away from fatty foods. But the family said that they credit a brachah she received from Rabbi Yosef Yitzchak Schneersohn, zt”l, the Lubavitcher Rebbe, during a visit to New York in 1929. As one of the few people who owned a car that came to the seaport to be mekabel panim the Rebbe, Evelyn’s father, Reb Yair Yitzchak Jacobson, drove the Rebbe to his lodgings. He frequented the Rebbe’s house over the next few weeks. When Mrs. Kozak, then 30-years-old, became sick, Reb Yair Yitzchak ran to the Lubavitcher Rebbe for a brachah. “She should have arichas yamim,” the Rebbe responded. The 19th yahrtzeit of Rabbi Menachem Mendel Schneerson, zt”l, was marked on Tuesday. Evelyn was born on Aug. 14 (8 Elul) of 1899 in the Lower East Side to Reb Yair Yitzchok and Sarah Kailya Jacobson, immigrants from the town of Nezhin, Russia. They were Lubavitcher Chassidim who came to the United States in 1886 determined to buck the trend of melting into the secular pot. 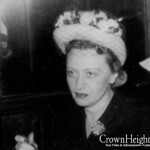 “Her father remained shomer Shabbos even though that was unusual in those days,” Mrs. Weisberger noted. The Jacobsons later moved to Flatbush where he helped set up Congregation Tzemach Tzedek Nusach Ari. 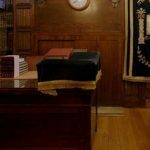 Mrs. Kozak used to say that the only two sifrei Torah in Flatbush — and possibly in all of Brooklyn — at the time before the Great War, were located in her father’s house. Finishing eighth grade, Evelyn left school and went to work for her father at his hat box factory. She married Samual [Meshulam] Margereten, to whom she bore five children. She later remarried but upon the passing of her second husband in the 1950s, declined further marriage prospects. Following her first marriage, Mrs. Kozak moved to Perth Amboy, N.J., later relocating to Miami Beach, Fla., where she managed a boarding house for the elderly. She took care of people younger than herself well into her 90s. But following the first of two strokes, she moved in with her granddaughter Bracha Weisberger and spent the past three years in Flatbush as the second to the oldest New Yorker. “She was much happier here, all the people of Kensington were always coming to her for brachos,” Mrs. Weisberger said. Mrs. Kozak spent the past three years in and out of hospitals, escaping medical emergencies several times. “We just thought that she would live forever because she always pulled through no matter what,” her granddaughter said. Mrs. Kozak had a heart attack Monday night and was hospitalized in Maimonides Medical Center. She passed away early Tuesday morning. The levayah took place at Shomrei Hachomos chapels in Boro Park. Maspidim included three of her grandchildren, Meshulam Margereten, Yishai Polon and Avraham Weisberger. Harav Yechezkel Weinfeld, a Flatbush Rav the family was affiliated with, was also maspid. Kevurah was in Washington cemetery near her father and grandparents. Mrs. Kozak is survived by, ybl”c, her children, Mrs. Paula Lebow of California, Mrs. Ruth Terner of Pittsburg and Reb Yoel Yitzchok Margereten of Tucson, Ariz., grandchildren and great-grandchildren, all of whom are frum. Her son is sitting shivah at his son Yehudah’s house in Lakewood at 770 Marlin Ave. until Monday morning. Interesting that shiva is in Lakewood at 770!